The mother of Sandra Bland, the Illinois woman who committed suicide in a Texas jail after being hauled there for back-talking a police officer during a traffic stop, still doesn’t believe her daughter took her own life. In a new documentary, Say Her Name: The Life and Death of Sandra Bland, which premieres Monday on HBO, directors Kate Davis and David Heilbroner follow the Bland family as they attempt to get answers about what happened. Bland, 28, was starting a new life and career at her alma mater Prairie View A&M when she was pulled over by Texas Department of Public Safety trooper Brian Encinia on July 12, 2015, for failing to signal a lane change. Camera footage from the stop shows that Bland was compliant, but apparently insufficiently deferential to Encinia. He arrested her and took her to the Waller County jail, where she was charged with assaulting a law enforcement official. Three days later, Bland was dead. A state autopsy and an independent autopsy concluded she died by asphyxiation, the result of hanging herself in her cell with a noose made from plastic garbage can liners. The independent coroner, in presenting her findings to the Bland family, surmises that law enforcement was indirectly responsible for Bland’s death — “Someone’s spirit can be broken in a short amount of time,” she said. Bland’s death highlighted the fact that unjustified police violence, followed by character assassination via media release, is not only experienced by black men and boys. The circumstances surrounding Bland’s death are still characterized by frustrating uncertainty. A jail employee who was supposed to check on Bland every hour while she was in solitary confinement falsified official reports of his work. He simply didn’t bother to walk down the hall to check that Bland was alive, but marked that he had. Waller County Sheriff R. Glenn Smith insists that Bland’s death had nothing to do with race. The state trooper who reached into Bland’s car to drag her out of her vehicle, as captured by dashcam and bystander phone camera footage, faced infuriatingly few repercussions. A grand jury indicted Encinia on a perjury charge that was later dismissed after he agreed not to work in law enforcement again. He was fired from his job as a state trooper, and that was it. 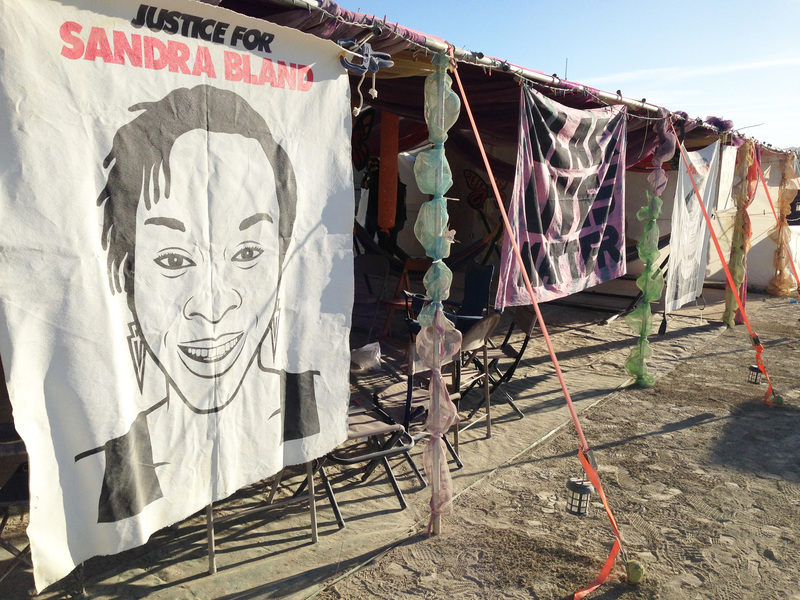 A makeshift memorial to Sandra Bland. While the filmmakers gesture at broader issues of race and policing in Waller County, a couple of threads would have benefited from further exploration. Waller County is home to Prairie View A&M University, a historically black college. A Prairie View resident proclaims that the jurisdiction is overpoliced by five different law enforcement agencies, including the sheriff, state troopers, Prairie View police, and campus police. I wish Davis and Heilbroner had followed up with statistics comparing arrests in Prairie View with the larger, whiter community of Waller County at large. Similarly, the film mentions that the Hempstead City Council fired Sheriff Smith from his previous job as Hempstead police chief due to complaints of misconduct and racial bias, but doesn’t provide further details. Smith was subsequently elected as county sheriff anyway. Bland talked about black-on-black crime. She blamed racism on both black and white people, saying both groups needed to make more friends across racial lines. She also cheerfully referred to the black people watching her videos as “kings” and “queens.” She was dedicated to educating herself and others — she recorded one video from the DuSable Museum of African American History in Chicago, radiant with pride and enthusiasm. “Sandy is gonna speak whenever I see something wrong,” Bland informed her audience. More than anything, the value in Say Her Name lies in its refusal to allow Bland to be silenced, even in death.